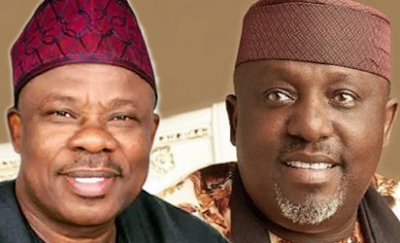 The national working committee, NWC, of the All Progressives Congress, APC, has suspended the governors of Ogun and Imo states, Ibikunle Amosun and Rochas Okorocha over anti-party activities. APC took the decision at its National Working Committee meeting held today in Abuja. The NWC of the party further recommended the expulsion of the duo from the party for brazen anti-party activities. The Duo were made by apc they did not make apc, they betrayed apc, why didnt they contest under another party may be they will win.Amosun is a disappointment.